Yes, you need both light and dark gingerbread cookies in your life come Christmas time. One is sweeter and milder. The other is stronger and spicier. Because you and your loved ones deserve to have things exactly as you like. 1. In a large, deep-sided saucepan over medium-low heat, combine the light molasses, sugar, butter, lemon zest, and spices and cook, stirring frequently, until the sugar dissolves, about 5 minutes. 2. Increase the heat to medium high and bring the mixture to a boil. Remove from the heat and vigorously beat in the baking soda. Be careful as the mixture will froth up. Mix briefly just until combined and then let cool for 15 minutes. 3. In a medium bowl, sift together the flour and salt and then fold it into the mixture in batches, using a wooden spoon or a stand mixer. Beat in the egg until just combined. Do not overwork the mixture or the cookies will spread during baking. The dough will be very sticky. 5. Meanwhile, in a large, deep-sided saucepan over medium-low heat, combine the dark and light molasses, sugar, butter, orange zest, and spices and cook, stirring frequently, until the sugar dissolves, about 5 minutes. 6. Increase the heat to medium high and bring the mixture to a boil. Remove from the heat and vigorously beat in the baking soda. Be careful as the mixture will froth up. Mix briefly just until combined and then let cool for 15 minutes. 7. In the bowl of a stand mixer, sift together the flour and salt and then add the baking soda mixture in batches. Beat in the egg until just combined. Do not overwork the mixture or the cookies will spread during baking. The dough will be very sticky. 9. Preheat the oven to 325°F (163°C). Adjust the oven rack to the center position. Cut a large piece of parchment paper. 10. On a large sheet of parchment paper, roll out the gingerbread dough to a thickness of 1/4 inch (6 mm). 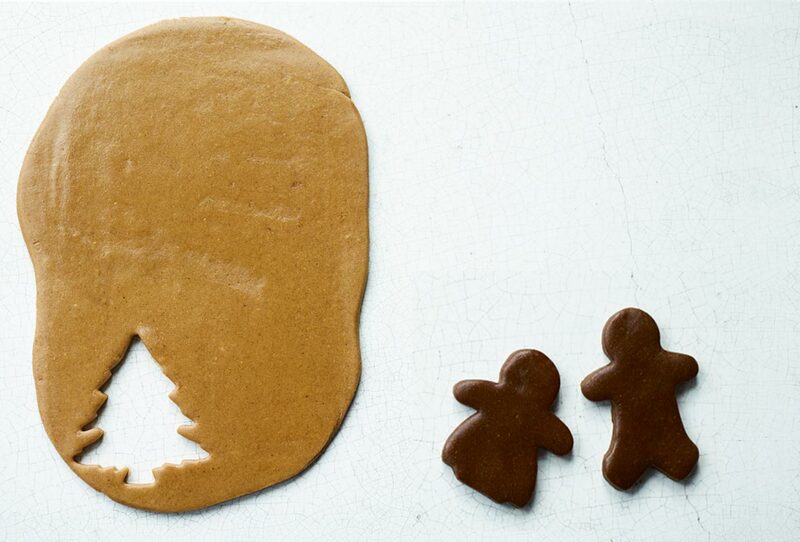 Use cookie cutters or gingerbread house templates to cut shapes. Leaving the dough on the parchment, carefully transfer everything to a rimmed baking sheet. Gather any scraps of gingerbread cookie dough and either roll them out on a second piece of parchment paper and make more shapes or wrap the dough in plastic wrap and refrigerate it for another day. (Never throw away scraps of gingerbread cookie dough!) Place the baking sheet with the gingerbread cookie dough in the freezer for 10 minutes. 11. Bake in the oven in batches until the cookies are golden brown at the edges, 10 to 20 minutes for smaller pieces and 20 to 25 minutes for larger pieces. (The longer the baking time, the stiffer the gingerbread cookies, so if you are constructing a gingerbread house or something similar that requires support, bake the cookies until a little more golden than you might usually bake a cookie. The oven temperature in this recipe is intentionally lower than many cookie recipes to help the dough hold its shape well and for the cookies to bake through entirely without over browning the surface.) Let the gingerbread cookies cool for 5 minutes on the baking sheet, then carefully transfer to wire racks to cool completely. You can keep the gingerbread cookies at room temperature in a covered container for up to several days. If constructing a gingerbread house, it will keep at room temperature for up to 2 weeks if kept out of direct light and in a cool, dry environment. Just sharing a word of caution from the author that if you opt to use honey in cookie dough, it can cause the cookies to spread a little during baking. Just thought you should know in case you’re seeking cookies that have super precise and straight lines. 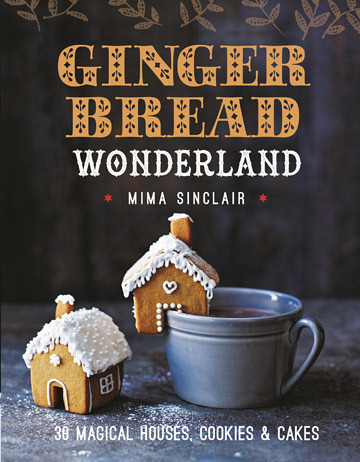 Light and Dark Gingerbread Cookies Recipe © 2016 Mima Sinclair. Photo © 2016 Tara Fisher . All rights reserved. All recipes and photos used with permission of the publisher.